Oil on cardboard, 25 x 34 cm. While many of the Danish Golden Age painters used their stay in Rome to study nature and ancient works of art, Marstrand’s attention was fully devoted to the life and labours of the Italian people. The artist enjoyed depicting snapshots from the passionate everyday life of ordinary Italians rather than studying the Pompeian paintings of old, to which many of his colleagues dedicated their time. 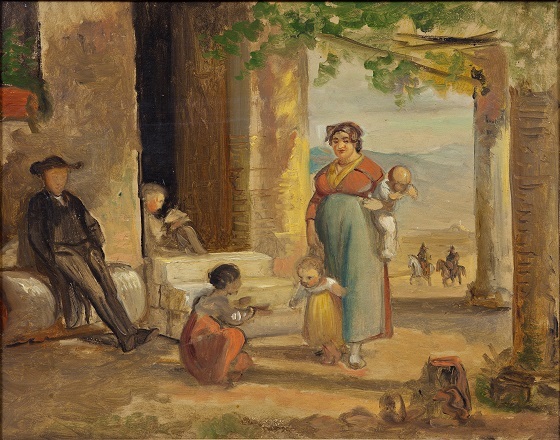 This prestudy depicts a scene from a typical Italian family’s everyday life. Beneath the shade of a pergola, a little girl stretches out her arms in an inviting gesture towards her little brother. Her mother tries to support the little brother as he takes his first steps while holding her third child in her other arm. To the left sits an abate on a stone bench with his hands in his pockets, while in the doorway a boy is engrossed in his book.